Focal expands high-end headphone range with Stellia | What Hi-Fi? 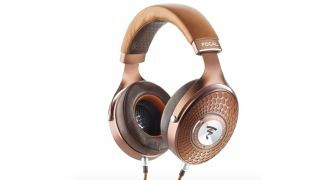 Focal has today drawn the curtains on a new pair of high-end, closed-back headphones, the £2799/$3000 Stellias. The Stellias, which we were given a behind-the-scenes look at during CES last month, are Focal’s second pair of closed-back headphones after introducing the sub-£1000/$1000 Elegias last year. These gorgeous puppies (just look at them…) utilise Focal’s next-gen drivers, which include several familiar Focal technologies such as ‘M’-shaped pure Beryllium dome and a copper voice coil - as found in its siblings. Vents have been integrated into the design to extend the speaker driver’s frequency response, while foam has been positioned behind it to absorb high frequencies. No doubt hoping to replicate the Utopia’s success, they also borrow the headband and yoke mechanics developed for the flagships. With that innate curvature, their memory foam leather earpads, and their two cognac and mocha finishes in mind, the Stellias do ooze a certain luxury - as you'd expect for their price, of course. High-end headphones deserve high-end care, of course, and to that end the Stellias come with a rigid travel case in matching cognac and mocha woven finishes, inside of which are both 3m, 6.3mm-ended and 1.2m, 3.5mm-ended cables. The Focal Stellias are available now, and we already can't wait to get our ears around them.